Marlie and Me: Fall 2013 #FashionistaEvents Giveaways Are Open for Entries! 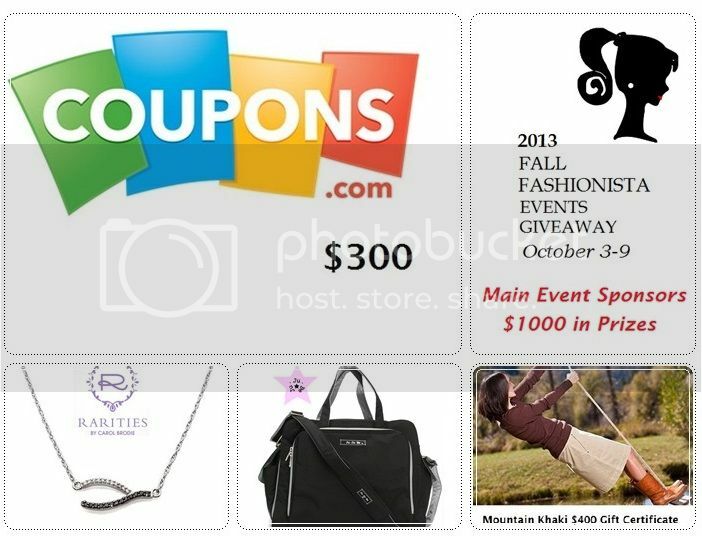 Fall 2013 #FashionistaEvents Giveaways Are Open for Entries! I am taking a fashion staycation this week so that I can take a trip to the The Fall Fashionista Giveaway Event! Starting today through October 9, I will be entering giveaways to win $26,000 in clothing, jewelry, shoes and other fashion prizes. Join me! 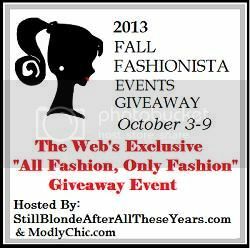 The Fall Fashionista Giveaway Eventis hosted by The Chief Blonde at Still Blonde After All These Years and Katy from ModlyChic. K Squared Glamour is our co-host! All Fashion! Only FASHION event! It is the largest Fashion Giveaway event on the internet with $26,000+ in prizes, 100+ participating blogs and 3/4 million entries. Each individual blog has a minimum of $125 prize! Oh, and I am hosting a giveaway too! My prize is this stunning sterling silver Edmon starfish necklace, valued at $230. It's perfect for your Christmas in Key West or your upcoming Caribbean cruise! Enter using the Rafflecopter form below. After you enter mine, scroll to the bottom of this post for the linky to hop to other Fashionista Giveaway Event blogs! LEGAL Stuff: 18 years of age or older to enter. Open to residents of US/CAN Only! Read Instructions carefully because rules vary from contest to contest. Make sure to provide a correct email address so we can reach you if you win. You have 48 hours to respond once contacted. Still Blonde after all these YEARS, Modly Chic, K Squared Glamour , Fall Fashionista Events Giveaway or the Fall Fashionista Events Giveaway bloggers are not responsible for sponsors/bloggers that do not fulfill their prizes or for any product failure or harm caused thereby. In most cases, shipping of prizes is the responsibility of the the sponsors who will be sending prizes to you directly. Your prize should arrive within 30 days, let us know if it doesn’t and we will TRY TO HELP OUT! The writer of this blog is self-sponsoring this giveaway. This Giveaway is not affiliated with, associated with or promoted by Facebook. Happy Entering! I would keep it as it is gorgeous. I would keep the necklace for myself and maybe let my 7 year old borrow it when she gets older! If I won, I would love to keep this for myself. Love it! If I won I would keep it! I grew up on the beach and now I am landlocked in Kansas, it would be special to me. If i won it would go to my most wonderful fiance for a wedding gift. I love starfish anything so I would probably keep this for myself. I would keep it. It's just my style. Well since it is okay I will keep for myself! I just love it. Honestly, I'm a little torn. I'd like to keep it, but it would also make a great Christmas gift for a friend. I would give the necklace to my daughter, it would look perfect on her! I would give this to my Mom. She is my best friend in the world and she loves the ocean so this would be perfect for her! I'd probably keep it for myself. I'm trying to accumulate a small collection of fun, summery jewelry, and this would be a perfect piece! Thanks so much for your generosity! I'd definitely keep this for myself. I would give this necklace to my daughter. She would absolutely love it. I would keep the necklace for myself. It would be for me because I love it! I loves stars a lot. I would definitely keep it. I would love this necklace for me. I love everything ocean! I would give this to my mom for her birthday in December. She loves starfish! I love starfish, so I would keep this for myself! I would keep it for myself! Or give it to my mom! I would give it to my mom, she loves anything to do with the ocean! id keep this for myself; i love starfish! i think I would keep it for myself as I love it! Definitely a pretty piece to wear in the summertime. I take my daughter to the beach each year at 7 she had cancer and is now in her 20's and she finds it so wonderful to be at the ocean. This necklace would be perfect to remind her of her trip each year we will have there making memories together. My mom loves the beach so I would give the necklace to her. I think even though I love this necklace, I would give it to my aunt if I win, She lives near the shore and collects starfish jewelry. I would give it to my oldest daughter as a Christmas present. Thank you! I LOVE LOVE LOVE this necklace and would keep it for myself. It reminds me of visiting my sister in South Carolina and walking on the beach. I would keep it for myself because I love the design. I would love to say myself but my son pulls every necklace I wear. My sister in law would love this though. So simple! Beautiful piece. I would give this to my niece who is 10, she recently went scuba diving for the first time and she loves (is obsessed with) sea life. I know this would be a driving force for her to continue her education and follow her dreams to become a marine biologist. Wow, this is going to be so hard to decide whether I should keep it or give it to my mother for Christmas. It's just so beautiful. I would keep it for myself. Sterling silver is my favorite jewelry metal. It would be for our youngest who loves the beach. 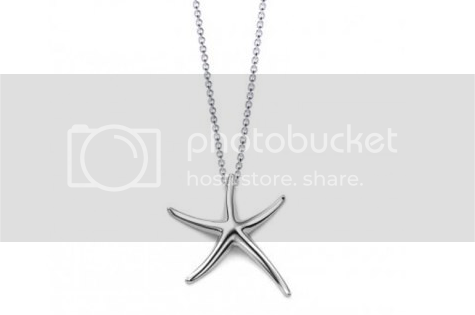 I've always loved Starfish and would keep this necklace for myself if I won. I have three daughters and one of them has a birthday in December so maybe this would be a great gift for her! Thanks! I'd be keeping this for myself! I would give it to my daughter for Christmas but I have 3 daughters so they better be nice. I would gift this beautiful necklace to my mom who will soon be going on her very first cruise. I would give it to my daughter for Christmas. I would make this necklace a gift for my sister. I would keep this for myself - to remind me of the beach when I can't be there! If I won the necklace, i would give it to my grandmother, who loves the beach and wishes she lived in California, but lives here in Tucson, AZ with us (her grandchildren and family) because she doesn't want to miss out on our lives. I would keep this for myself. I grew up as a Navy brat and was always near the water, so I love anything nautical. i would give it to my sister in law..its her style and she is hard to buy for. I would keep this one! Thanks for the chance to win! Probably me, unless my Mom really loved it. I would probably keep it for myself or give it away as a gift. Not sure yet! I really like it. I think my niece would love this. Thanks for a great giveaway! I want the necklace for me. Yes, I would definitely keep it for myself as I don't have but one necklace. This one is beautiful. I would keep it for myself as I am a mommy of soon to be 3 and spend all my time and money taking care of them that I neglect myself. I would share it with my daughter, but keep it for me. Really would like this one for myself! would surprise my wife with it!